Discover the story of Blue Bee Cider on a one-hour tour and tasting. 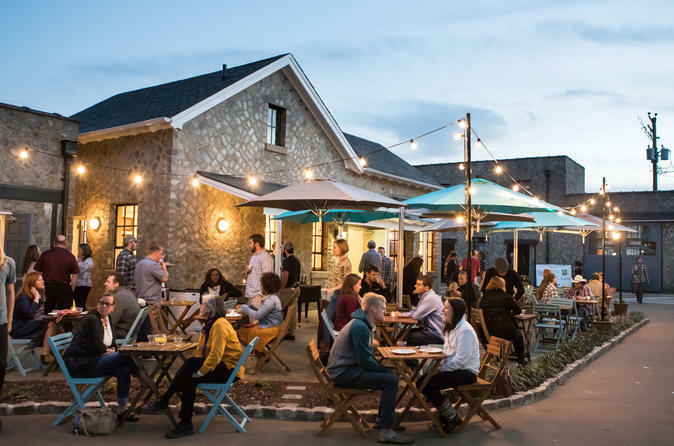 Learn how we became Virginia’s first urban cidery and create artisanal cider in a historic revitalized stables complex from the 1940s. Meet the Blue Bee staff, get a behind-the-scenes look at our unique property, and experience our ciders in a guided tasting. Blue Bee Cider, Virginia’s first urban cidery, is located in the historic Scott’s Addition district of Richmond, VA. There are three tour times available, depending on the day: 2pm, 4pm, and 6pm. During the one-hour tour and tasting, you will learn about the history of our cidery and the process of cidermaking. Our ciders are made with rare and heirloom variety Virginia apples that are prized for their tannin, acidity, and flavor. One of Virginia’s native bees (the Blue Orchard/Mason Bee), provided the inspiration for the cidery’s name. These hardworking bees are solitary and wild, emerging early in the cool spring just in time to pollinate apple blossoms. After the tour and tasting is completed, we invite you to stay and enjoy the ambience of Blue Bee Cider.